Releasing Your Potential was the title of a special 2 day programme delivered by NLP expert, Sue Knight, to members of Academy Group 2 (the London/Hertfordshire experiential learning group of The Academy for Chief Executives). For the first time, members’ partners also attended for part of the session – in total 28 attendees. The outcome was for each and every delegate to receive a profound piece of learning that they could take back and use within their businesses or homelife. 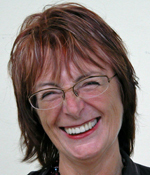 (Find out more about Sue [pictured, below] and the NLP process on her website at www.sueknight.co.uk). Through the NLP processes and Sue’s outstanding facilitation skills, Sue was able to deal with blockages that were preventing us from achieving our full potential. In truth, I was a little nervous about bringing partners along for the first time, however, I needn’t have been – the 2 days were a highlight of my time as a Group Chairman with The Academy. I was also delighted that the members who’d previously been serious sceptics of NLP had a experienced a complete change of mindset by the end of the session. For me, this provided a renewed passion for NLP and for this development tool to enhance the whole of the Academy process. Experiential business learning® at its most profound! The value of moving towards something rather than away from it. The Academy for Chief Executives, a leading provider of experiential business learning® facilitates peer groups of CEOs and Managing Directors who meet together every month to network and take full advantage of experiential learning. To hear great speakers like this every month and engage in The Board You Could Never Afford®, to find out more about the London/Herts Group, or to find a local group near you, visit www.chiefexecutive.com. Posted in: Business, Experiential Learning, Leadership, NLP.